You are a 3D software publisher and want to add a social layer and let your users show their creations in full 3D and VR glory online? Awesome, you came to the right place! We already partnered with many 3D creation applications that natively integrated our API to add a “Share to Sketchfab” button in their tool (see full list of partners here). The goal of the exporter guidelines is to help you build the best possible integration and understand all the benefits it will bring to your application. The exact implementation of the API will depend on your needs and the scope of the project (stand-alone application, plug-in, etc. ), but following some guidelines will help maintain a smooth publishing process and make your exporter as user-friendly as possible. Please keep us in the loop so we can track progress and offer support. Contact us with any questions. 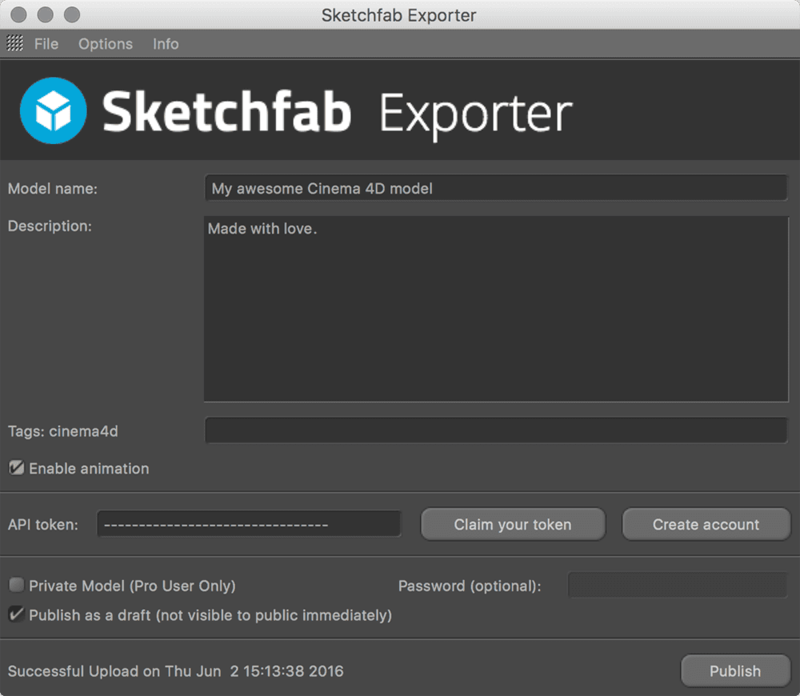 The Data API makes it easy to include Sketchfab as your 3D publishing solution. Prefer OAuth2 login over token authentication to offer a better UX. For security, do not expose API Tokens publicly. If using token authentication, offer to save the token for future use. Allow users to upload to their own account; do not use a generic account for all uploads. Users need to have control on their uploads to be able to edit their 3D settings and make their content (and your app's gallery) look beautiful. If you don’t want your users to be able to set their models as downloadable we can blacklist the source parameter of your app and disable download for these uploads. When possible, allow users to cancel while the file is uploading. Offer basic metadata: Name, Description, Tags. 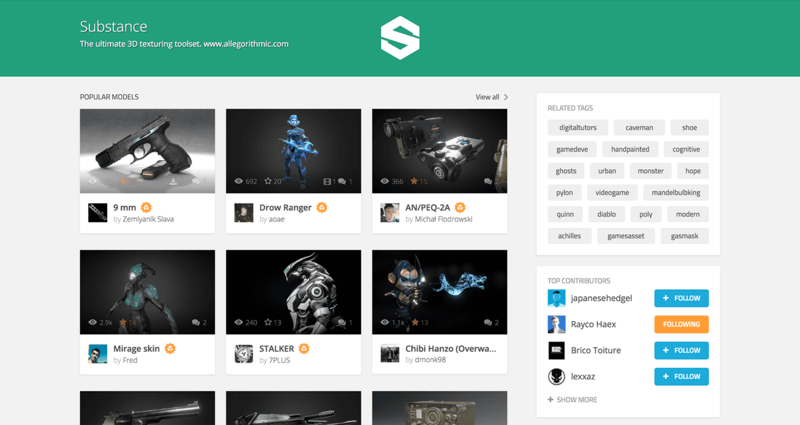 More data from your users means better search results on Sketchfab and more exposure for your app. Offer Private and Password fields; indicate that these are PRO features. We have a referral program where users can receive a free PRO accounts. Offer to publish models immediately or upload as a Draft. Draft mode lets users edit their 3D settings before the models appear in the newsfeed of their Sketchfab followers. Add an option to auto-share to Facebook. We partnered with Facebook to natively display our 3D viewer in the Facebook newsfeed. Your users will love to easily share their creations with their friends on the most famous social network. Learn more about the workflow with OAuth. Warn users about file size limits (Free: 50 MB; PRO: 200 MB; Business: 500 MB). Use ZIP/RAR/7z compression to save bandwidth and maximize upload size. Automatically append 1 or 2 tags related to your software. This will generate a gallery for your software that we can customize with your logo, tagline and a link to your website. Check out this example for Substance Painter. 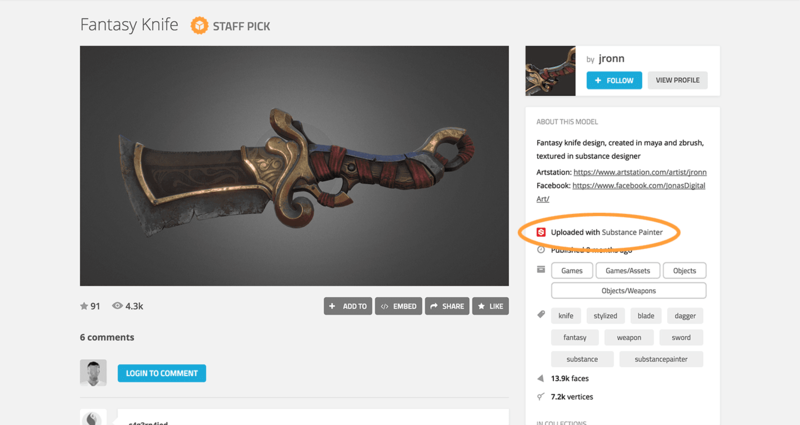 Adding a source parameter to your app allows us to identify your content and add a custom label like "Uploaded with Substance Painter" on all model pages. We can also add your app to the Exporters page. Integrate the share to Sketchfab button in your VR interface in a place easily accessible for the users. Display a message such as "Take off your headset to continue sharing your creation with the world." Open a pop-up menu on the user's desktop so they can log in or sign up using OAuth2 login. Once logged in, let your users fill in their model information: title, categories, description, tags, etc. and click upload. If you plan to implement the Upload API in a public application, the 'source' parameter is very important. We use it for internal tracking, and it can be used to create custom processing pipelines on our end if there is a need. It is not exposed publicly. It should be explicit and remain constant for the lifespan of your application. For example: 'source': 'zbrush-exporter'. It should contain only lower-case letters and hyphens ('-'). DO NOT include any periods/dots ('. '), like 'myapp-2.0', or spaces. If you want to include dynamic version information ('3dsmax-18000', '3dsmax-17000') or distinguish between users ('qubicle-trial', 'qubicle-pro'), or if you have any doubts about the 'source' parameter, PLEASE contact us. To make the most of file size limits and minimize bandwidth usage, you should compress your model file(s) into a ZIP, RAR, or 7z archive. Giving us access to any source code that uses the API means we can help test, debug, and look for potential problems. We understand that this might not be feasible for non-free software. For public, free applications or plug-ins, explicit GNU GPL or MIT License is preferred. Hosting the source on GitHub is a good option, as we may choose to contribute to, fork, or host some exporters ourselves. Any other features you want to include are great! For example, the 3ds Max exporter has robust texture management and light baking features. Many of the 3D Scanning tools with Sketchfab publishing automatically set some 3D settings like Orientation and Shading. We're happy to discuss these possibilities, just drop us a line.